We described on the "Kids initiate" page a project of a child who, raised silk arvae and sold them near kindergartens to parents who were interested in showing their children closely the wheel of life of the larva. In light of this great interest in raising silkworms, especially in the spring, and for the benefit of those interested, every stage of the development process of the silkworm is described here. 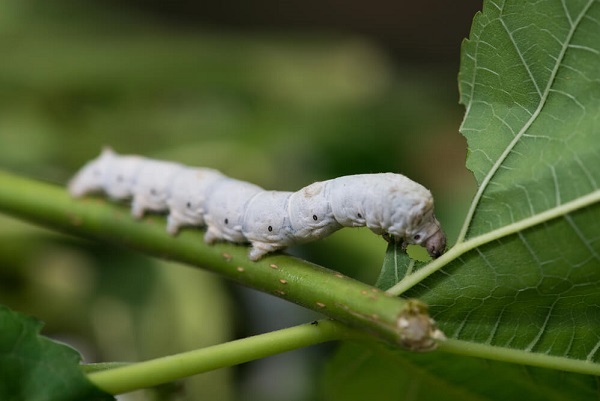 It should be noted that the term silk caterpillar was done here because it was the most common form of Google search, but the name is silkworm, and the larval form is only one stage of their life cycle. Usually, the children are familiar with the silkworms when they are already at the larvae stage, but before that, silkworm eggs were actually shades of gray, as pictured here. The larvae, eggs are kept in a refrigerator for a year and get out in the spring - just at the time when the mulberry is blooming. 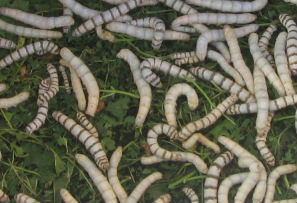 In the picture - eggs of silkworms. You can also get to the stage where you will have silk caterpillar eggs as long as you implement all the steps with us. Why after Passover? 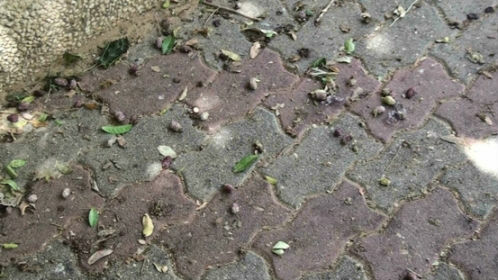 Because in Israel, Passover occurs in the spring, and just before Passover, mulberry trees begin to bloom, and in order to feed the larvae, we need large leaves to fill the feeding needs of the larvae. 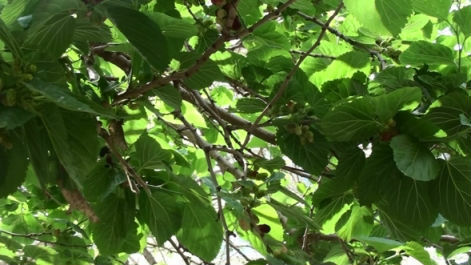 In this we picture we see the beginning of the flourishing of mulberry trees - the picture was taken before Passover. The tree in the picture is a mulberry tree; we can see it growing strawberries. Sometimes it is possible to see the berries fall from the tree on the ground, and you would then know that a mulberry tree grew there. But do not bother looking for silkworms on mulberry trees, because they do not survive in the wild. 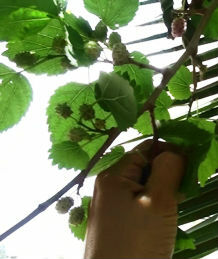 As there are now strawberries in the ground under the tree, we'll pick leaves from the mulberry tree. 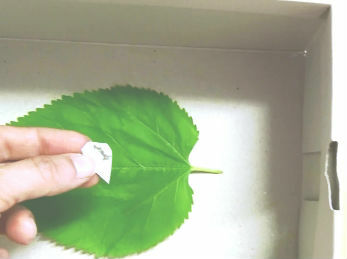 We will put a mulberry leaf in a wooden shoe box, and on top of the leaf, we will put the larvae eggs. In the picture - larvae eggs inside a shoe box. After 10 days, the larvae, which are the size of about 2 mm, hatch from the eggs. Please note that the larvae are so small that you may not see them. That is why we recommend that you place fresh leaves around the eggs so that if we fail to see the hatching larvae, we could still pick them up. With the eggs begin to hatch, the larvae eat and grow quickly. 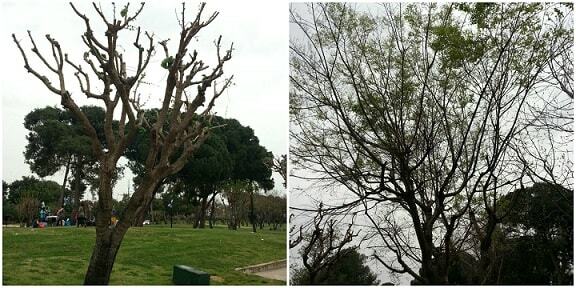 Therefore, we must persist in replacing the leaves and take care of them so they have a supply of fresh food. To avoid damage to the larvae mounted with fresh leaves, every time we add new leaves to the existing ones, we will not remove the dead leaves. The larvae will feel the fresh leaves and will eat them, and only after they move, we are able to remove the dead leaves. Over time, as the larvae grow, we can pick them up by hand and transfer them with fresh leaves and then remove the dead leaves. To be able to reproduce, larvae are divided into two sexes: male and female. But during their larvae, it is difficult for us to distinguish between the two species, and therefore, those interested in seeing the entire life cycle of silkworms should have more than two caterpillars to increase the probability of finding two species. In the picture - mature larvae silk. Be prepared that silkworms eat a lot, so make sure to fill the stack of leaves from the mulberry tree. To maintain the freshness of the leaves, you can store them in a bag in the refrigerator. As the larvae grow bigger, you will notice that they are looking for a place to spin their cocoon, which would serve as a convenient place for them to make a caterpillar golem. Most of the larval body weight is liquid silk, in it the larva secretes with two nodes that are on both sides of his body. Once the caterpillar secretes a liquid silk, he creates a long continuous fiber that weaves itself around the undercarriage. Once the caterpillar begins spinning expropriation, it is recommended that you don't touch the yarn so as not to interfere with this natural process. We see in the image below a caterpillar that has begun to spin the expropriation process, and a single cocoon is ready. Until the last larvae spins the expropriation, we will continue to provide it with mulberry leaves. We cannot see the process that is going on within the cocoon, but for two or three weeks the larva's body undergoes changes during which it becomes a golem and in the end, it becomes a white butterfly. Even though the expropriation is made from a very strong silk thread, the butterfly secretes a yellowish liquid. This material melts the silk threads and creates a hole in the cocoon and the butterfly emerges from it into the world. Now we can just look and enjoy. No need to worry about food for butterflies. 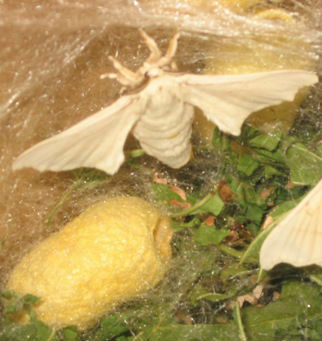 Silkworm butterflies are unable to eat; they live thanks to the food store accumulated from when they were larvae. 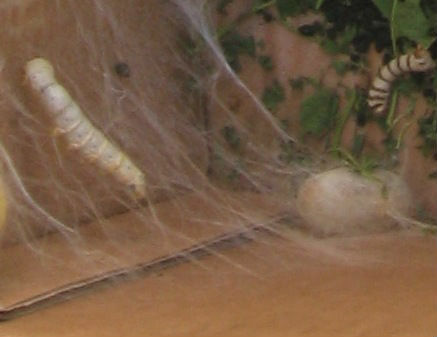 The female silkworm butterfly knows how to attract the male. She actually tells him she is ready to mate by the emission of a substance called Bombykol, which the males smell. The olfactory organs of the butterfly are located in their antennae. 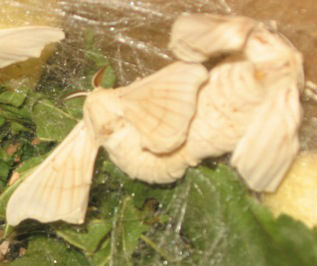 This stage is accompanied by very many wings, despite the fact that silkworm butterflies are unable to fly. For the next step we should take another shoebox, and put white pages inside it. At this stage, the females lay eggs on the white pages. The female butterfly lays between 300 to 500 eggs. 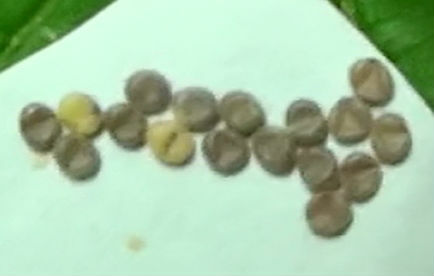 Initially, the eggs will be in shades of white, but after a few days they will become a gray color, indicating that the egg is fertilized, and can emerge from a caterpillar - meaning another cycle of egg - larva - cocoon - butterfly. They lay eggs with a sticky substance so they remain linked to the paper. 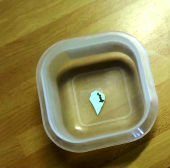 Then we can get the pages, cut out the areas where there is a concentration of eggs and keep them in a small plastic box with pieces of leaves in the fridge for next year. Those interested can learn more in the site Wikipedia on the subject of silkworms, and watch this video showing the life cycle of the silk larvae.